This is a carrier board for the famous Microchip Technology Inc.'s TCN75A digital temperature sensor and it includes all the external components required by the sensor. 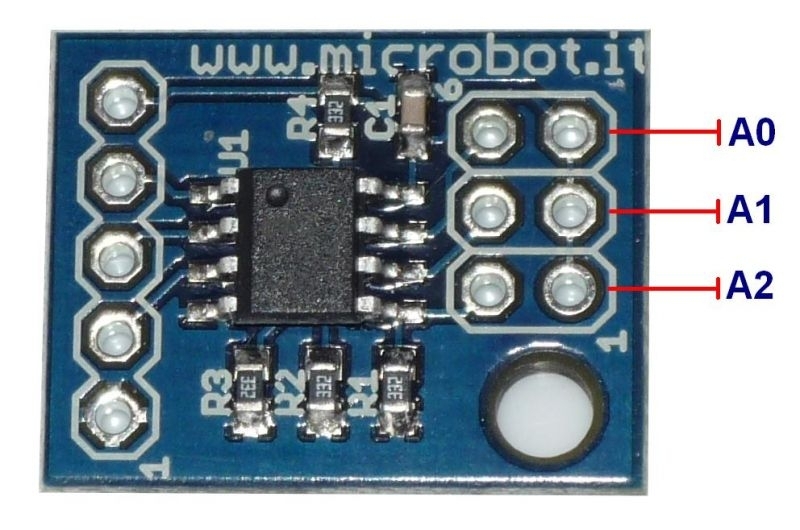 Its very small size (19x15mm) and its very light weight (only 1.1g), make it the perfect peripheral for small robots and for temperature monitoring systems. The TCN75A is a digital temperature sensor capable of reading temperatures from -40°C to +125°C. 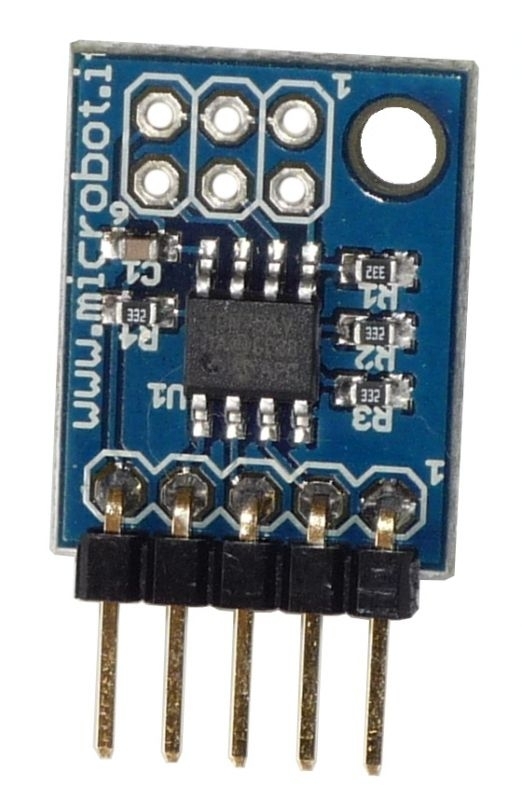 Temperature data is measured from an integrated temperature sensor and converted to digital word with a user selectable 9 to 12-bit Sigma Delta Analog to Digital Converter. The TCN75A notifies the host contoller when the ambient temperature exceeds a user programmed set point. 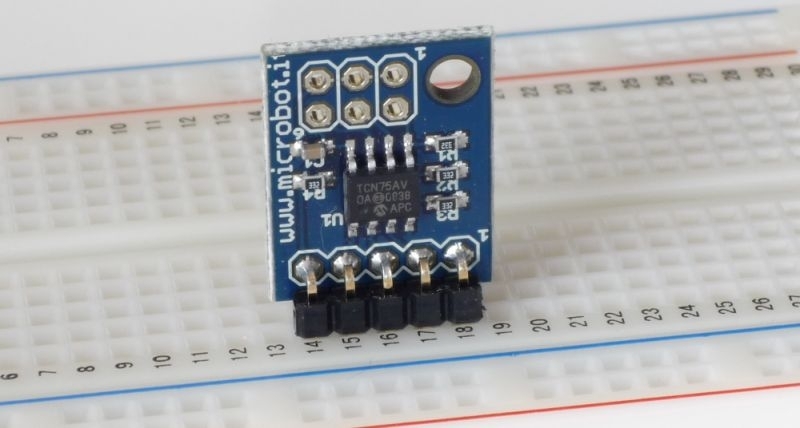 This alert output is programmable as either a simple comparator (active-low or active-high polarity selectable) for thermostat operation or as a temperature event interrupt for microprocessor-based systems. Note that for power saving sensitive applications it is possible to shut down the sensor, reducing the current to less then 2uA, and it is also possible to use the sensor in one-shot temperature measurement mode single convertion on command while in shutdown. Communication with the sensor is accomplished via a two-wire bus that is compatible with industry standard protocols (ie. I2C), allowing up to eight devices to be controlled in a single serial bus. This permits reading the current temperature, programming the set point and hysteresis and configuring the device. By default the board is set on slave address '(MSB)1001000(LSB)', but the lower three bits (A2, A1, A0) are selectable via the three jumpers positioned on the pcb. Small physical size, low power consuption and ease of use make this board an ideal choice to implementing sophisticated multi-zone temperature system management schemes in a variety of applications.